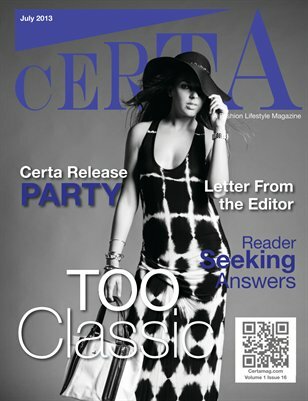 CERTA, a lifestyle and fashion magazine welcomes our too classic editorial, our first black and white cover. When the Idea of a black and white shoot was brought to my attention the first thing that came to my mind, was too classic. I immediately fell in love with the plan. Black and white photography can be soft, bold, romantic, graceful and of course too classic. When you think of black and white photos you think of elegance, there are a lot of artist that use black and white photography for artistic purposes. We here at Certa are you going to give you artistic, elegant photos with amazing pieces from Saks Fifth Avenue Off Fifth (St. Augustine). When you turn each page ask your self what black and white photos mean to you. Get ready to really appreciate the potential of black and white photography!